Quick Links: Led headlights lows highs drls and fogs Black out logos Roof Rack Showdown - Prinsu vs Southern Style Offroad H9 in H11 headlight sockets? TRD pro wheels, how to keep clean?!?? Door edge guards and body side moldings? Yes, they are stock size. No, there is no rubbing...but, I had already trimmed a hair off of the bottom of the front bumper cover where it meets the fender liner. I did that because there was a slight bit of rubbing with the last set of wheels I had these tires mounted on. Is that a blue weim that you have? Silver Lab. Litter we picked him from was split about 50/50 between the lighter silver color and the darker charcoal color that he is. KeavyD, Kyblack76, 4runningMan and 4 others like this. Nice. Im currently waiting on my SCS. Great looking wheels. Kyblack76, HoBoDanny and 417tundra like this. Do they do 4runners.com stickers here? I have a Tundras.com sticker on the truck already. Did some research and seems to be 100% Plug & Play. SgtReckless, Crossfit4Runner, 417tundra and 2 others like this. Would love to hear how the install goes and functionality. Nice. Do you know if this one turns off the truck when you open the door to get in, then having to re-start again with the key? No truck is supossed to stay running. I tried the 12 Volt Solutions remote start. Don't know if it was me or the module, but the truck would start and immediately turn off. I think the truck thought it was being stolen because the little key lock on the center console would illuminate after trying the remote start. Had to return it. I've had the Accessorides remote start with the OEM fob now for 3 months and have had no issues. The install took about an hour. The hardest part was taking apart the dash but there are a couple of youtube videos for other companies that show how to do it. The car will keep running when you open the door. It shuts off if you hit the brake pedal before inserting the key. I know the push start will stop when any door is open. Thanks for the info. Wish it was like in my F150, it would not shut down when the doors were open. can you link the you tubes about taking apart the dash, please? TIA! I used this one. The ports were you "plug" into are the same except this one involves some splicing of wires so just ignore that part at the end. If you google (4runner remote start) and look under videos there are a couple of them. Installed mine a couple weeks ago, its 100% plug and play, and YES, the vehicle stays running when you unlock and open the door. Just put your key in and turn to ON (not far enough to make it crank, obviously) then you are ready to drive off. Love that it can use the stock factory keyfob/key. make sure you dont press lock 3 times too fast, it wont recognize them, do about one a second. Which rear cojls wouls pair well with 887s up front? I think 895s pair with 885s and I think 887s are pretty close to that. 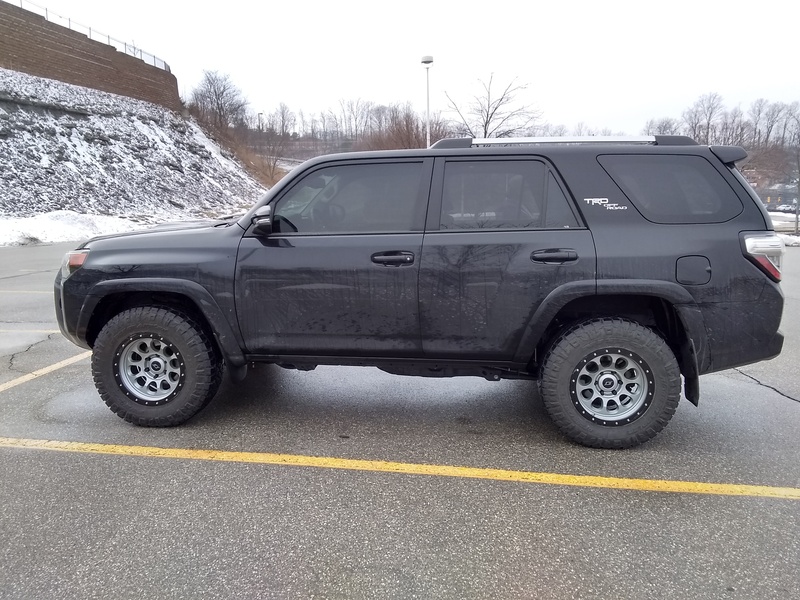 Lifted my wife’s 2018 limited 4Runner. 3” Rev Tech spacer lift, 275 85 R17 BFG KO2 tires, XD rims. Crappy picture. I’ll take a better one soon. I know a lot of people on this forum have asked about lifting the limited model. It looks so much better without the 20” rims. Looks less like a soccer mom ride now. It still rides great, but the nose dive is still there. Here’s before and after photos. jester243, 417tundra and Hwnrunner like this. Guys, this has been gone over 1000 times. If you have push start the truck WILL shut off when the door is opened. If you have regular key, the truck WILL NOT shut off when the door is opened. Doesn't matter what brand system you use, this is just how it works. BTW you guys paying $400 for a plug and play system off the OEM remote are getting ripped off. You can get a MUCH higher end system with an alarm and significantly better range for that money. I've been in this industry for 20 years, these systems are way over priced and all you're paying for is convenience. It's like a $6 soda off the roach coach. lmn930, SLoTH_XVX and WallyT4R like this. SgtReckless, 417tundra, 2016Pro and 4 others like this.